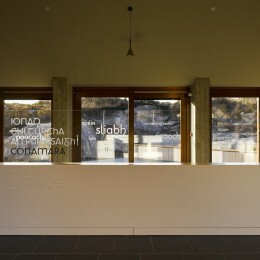 Ionad Cultúrtha an Phiarsaigh | Ros Kavanagh. 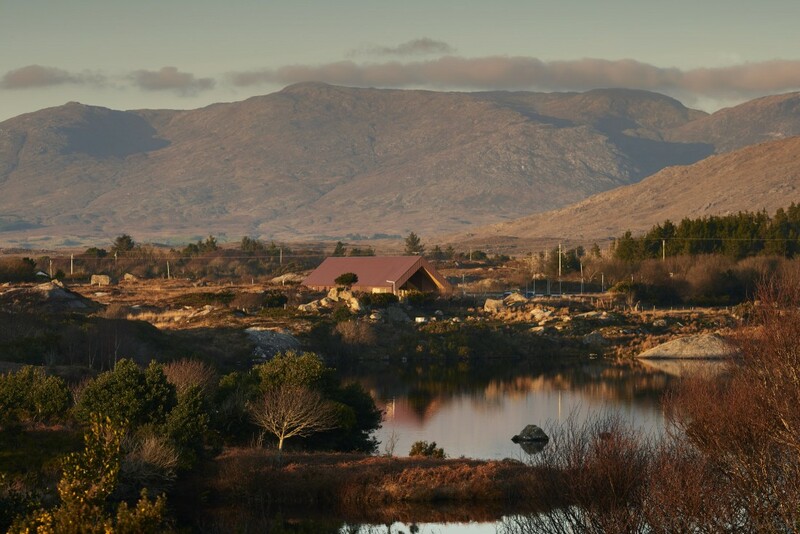 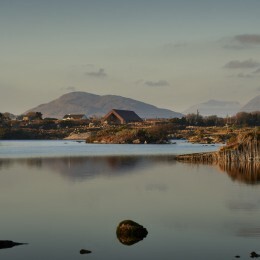 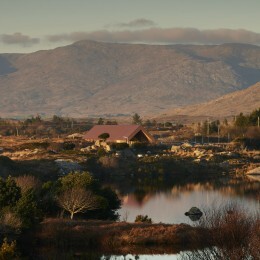 Ionad Cultúrtha an Phiarsaigh is located in Ros Muc, in the heart of the Connemara Gaeltacht, on the Wild Atlantic Way. 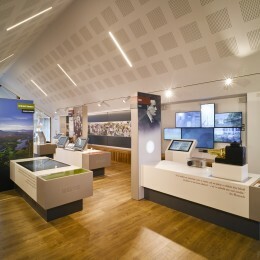 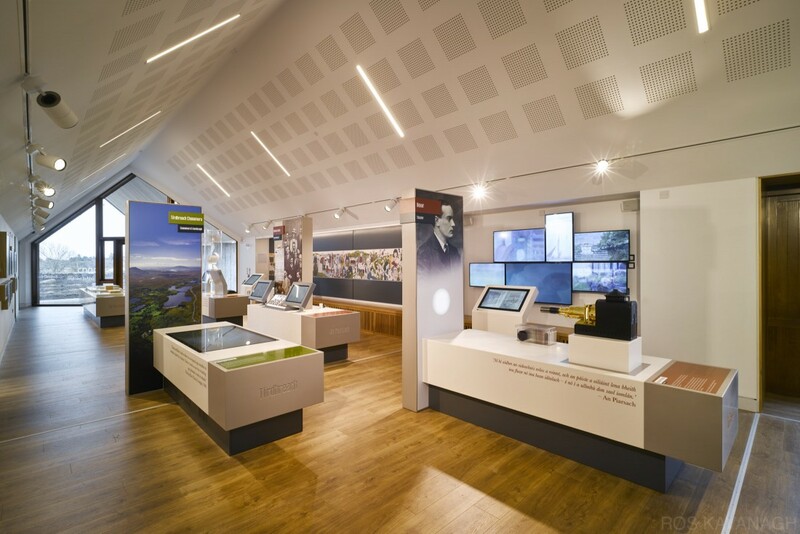 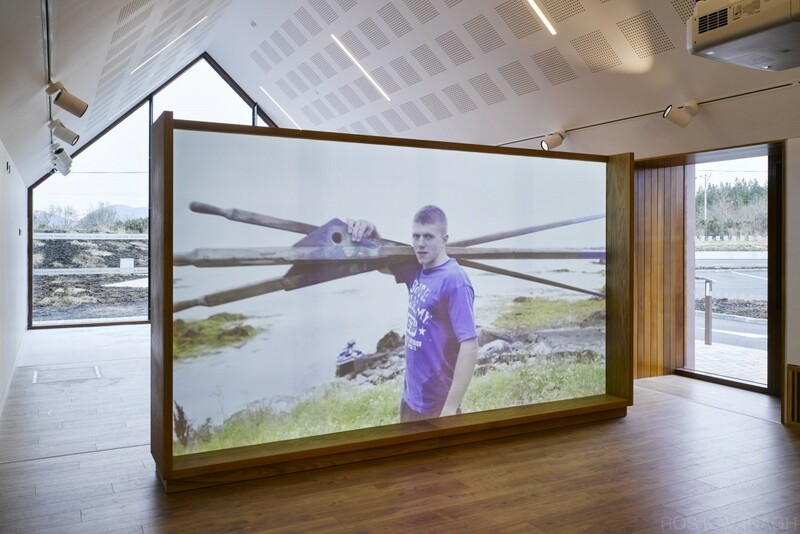 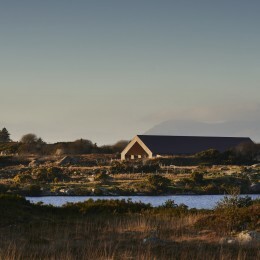 The basis of the architectural parti are the landscape setting and proportions of Pearse’s Cottage, where the writer, educator and leader of the 1916 rising built a cottage for himself on the shores of Loch Oiriúlach in 1909. 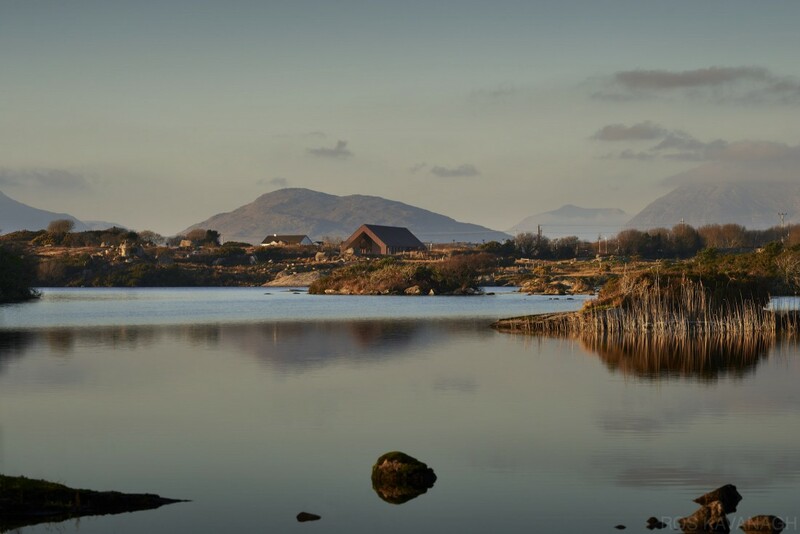 Pádraig Pearse took huge inspiration from the rugged essence of Connemara sparking hi mot write his orations. 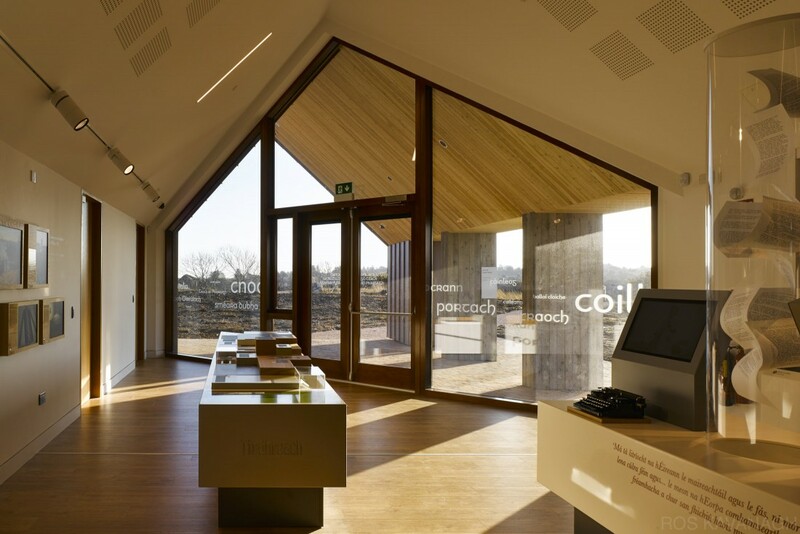 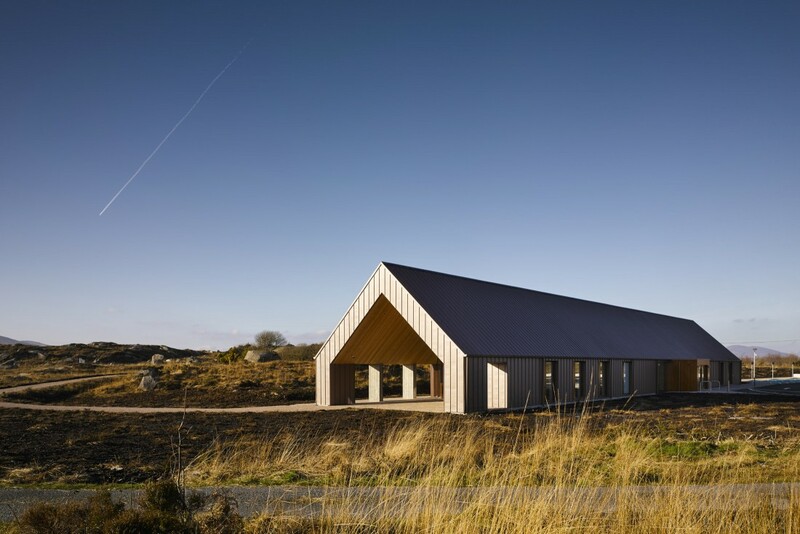 The 2016 building matches this thatched structure’s strictly vernacular 43-degrees roof pitch, spanning 10m deep along its 60m length. 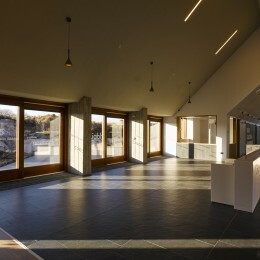 Within this, three primary public volumes are carved; one central entrance concourse and two side galleries. 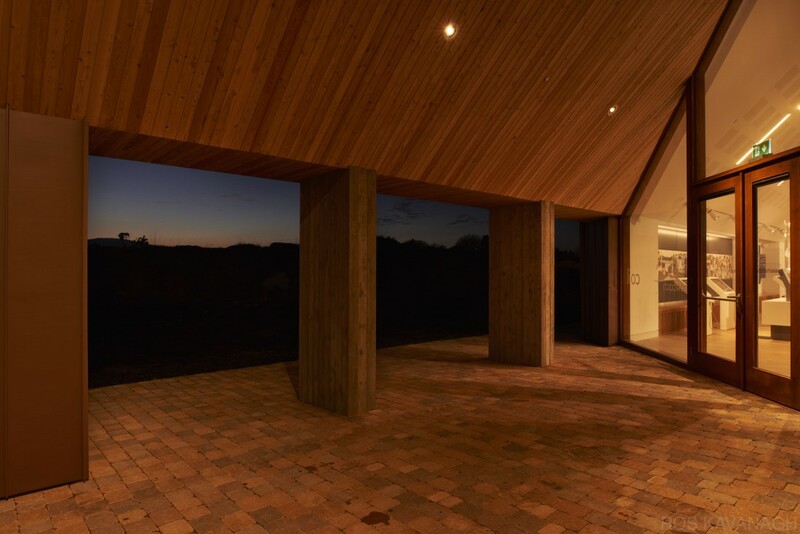 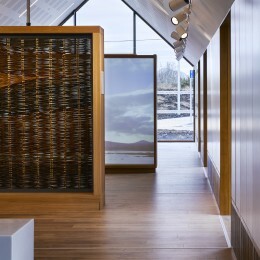 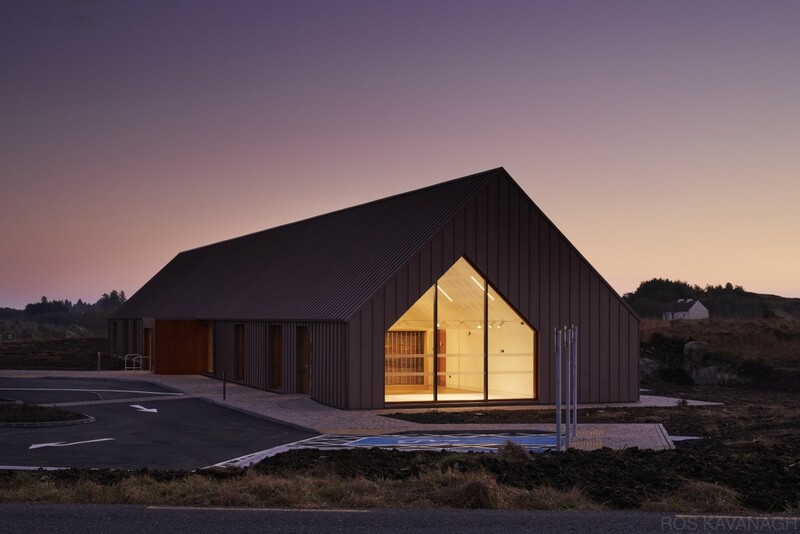 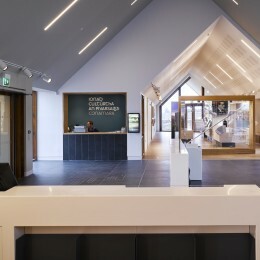 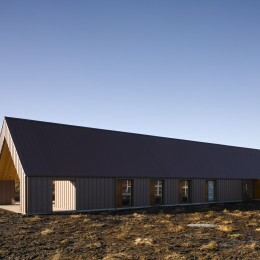 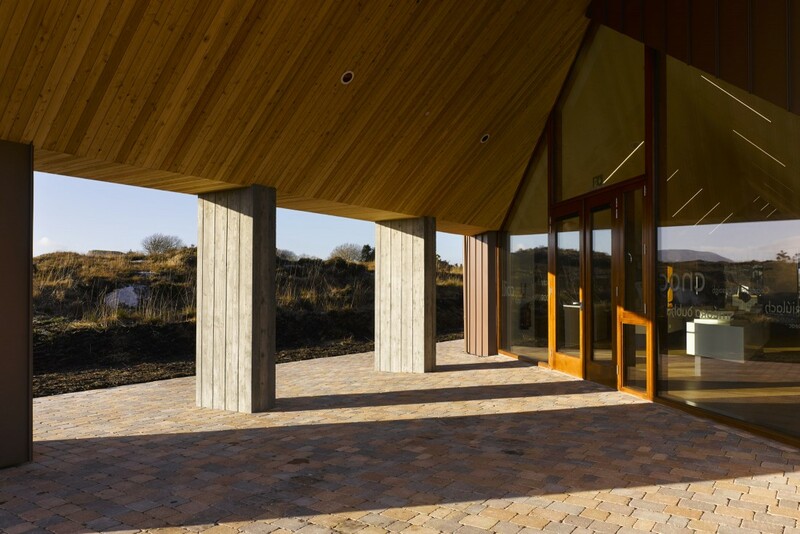 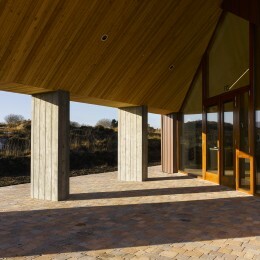 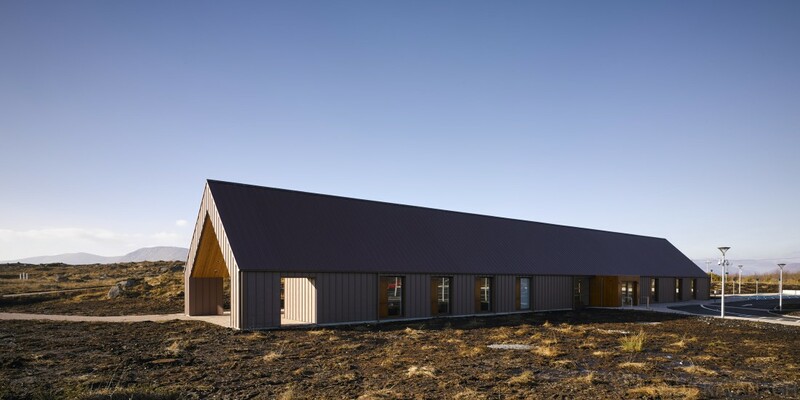 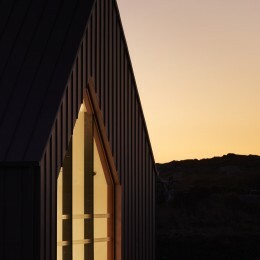 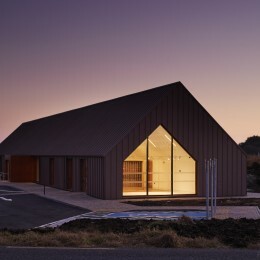 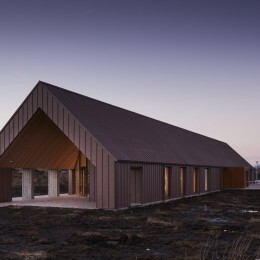 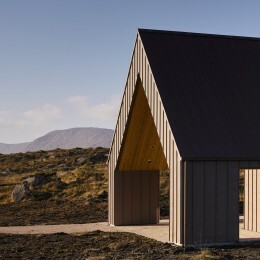 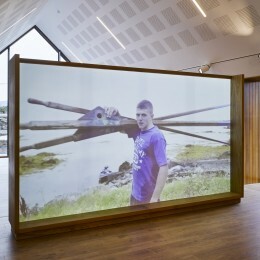 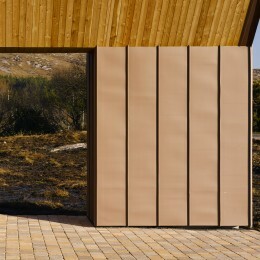 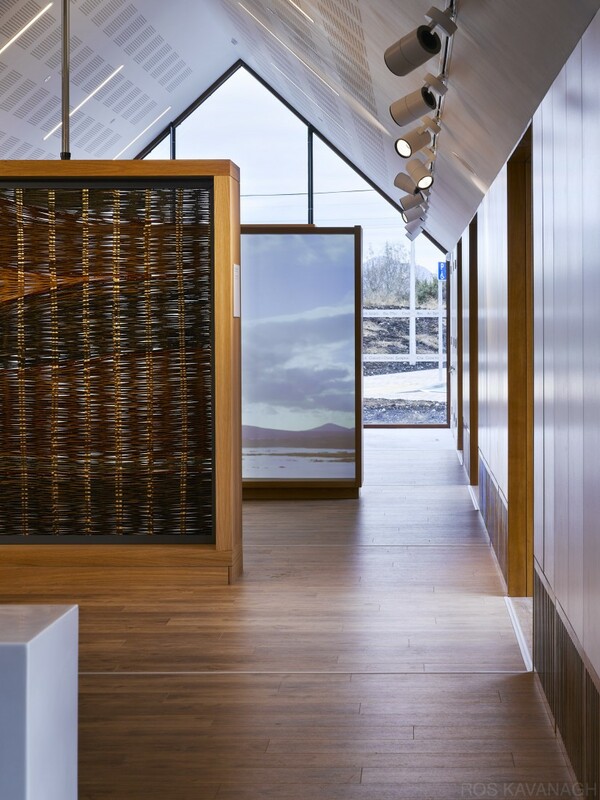 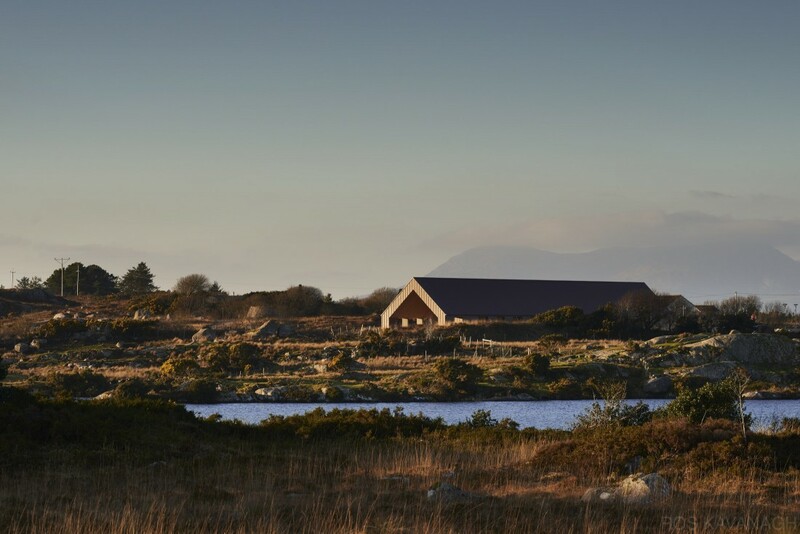 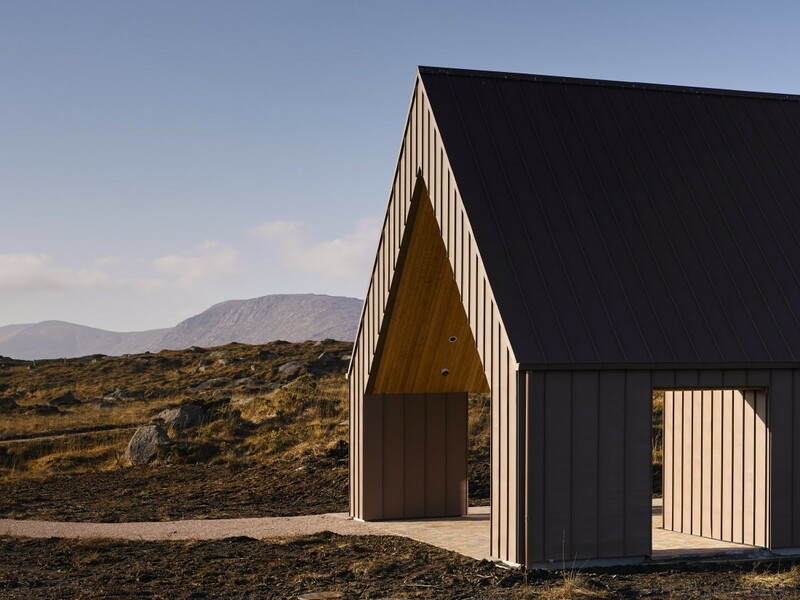 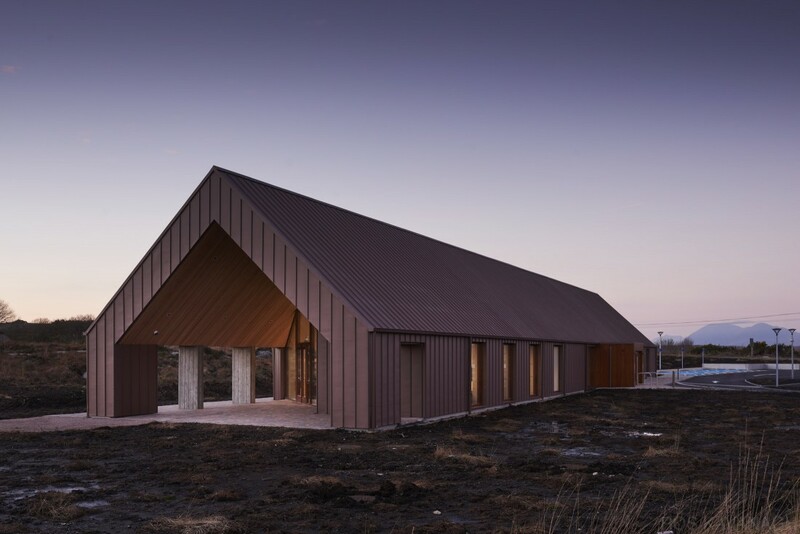 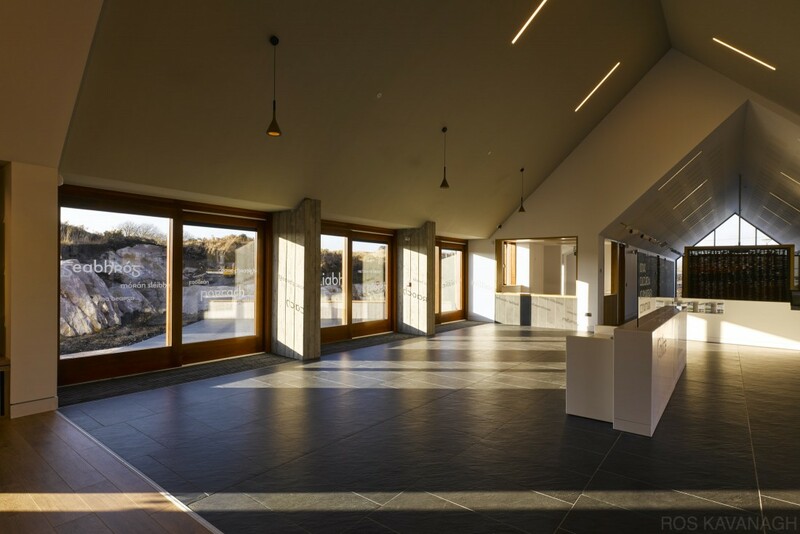 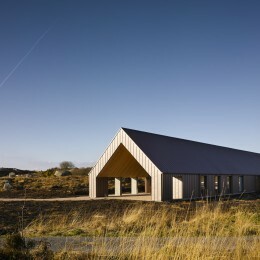 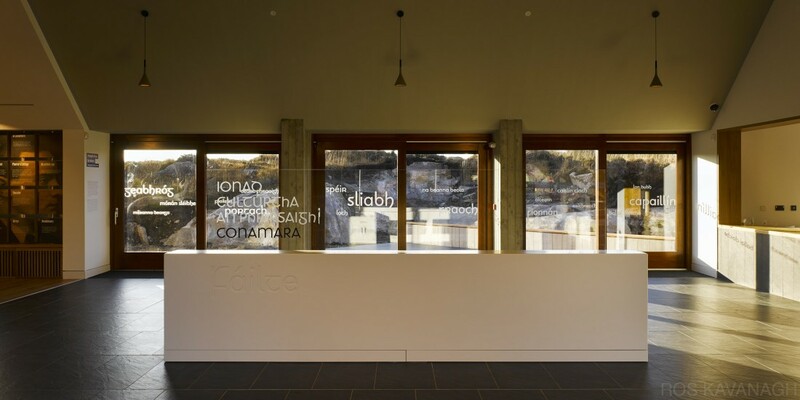 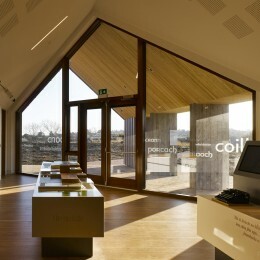 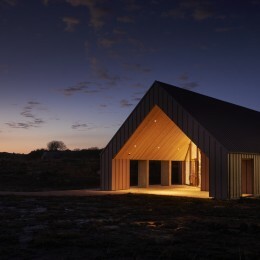 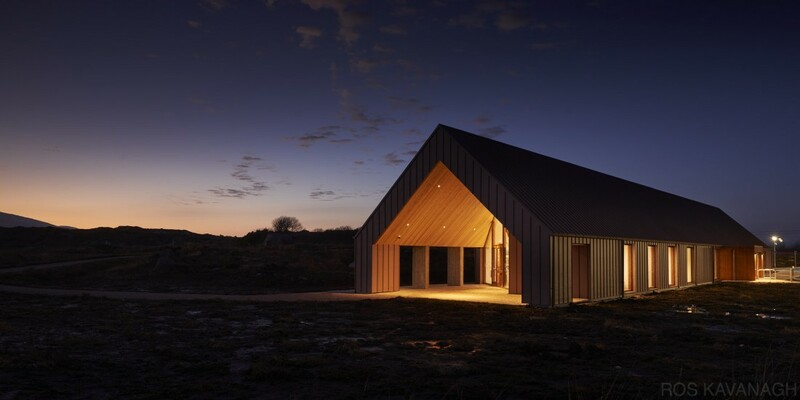 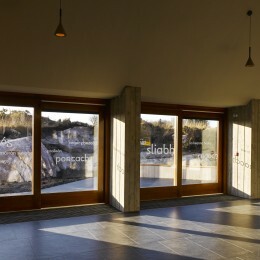 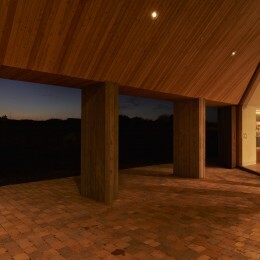 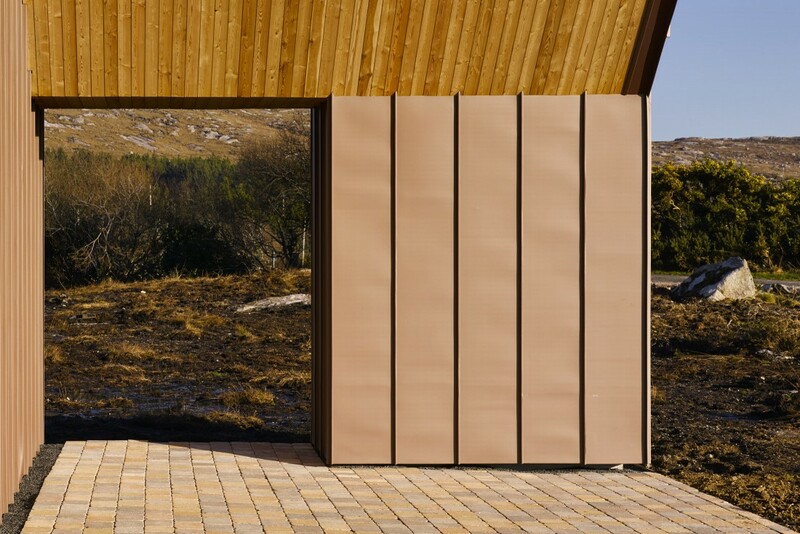 Exterior materials are considered to blend with the burnt shades of Connemara’s bog landscape. 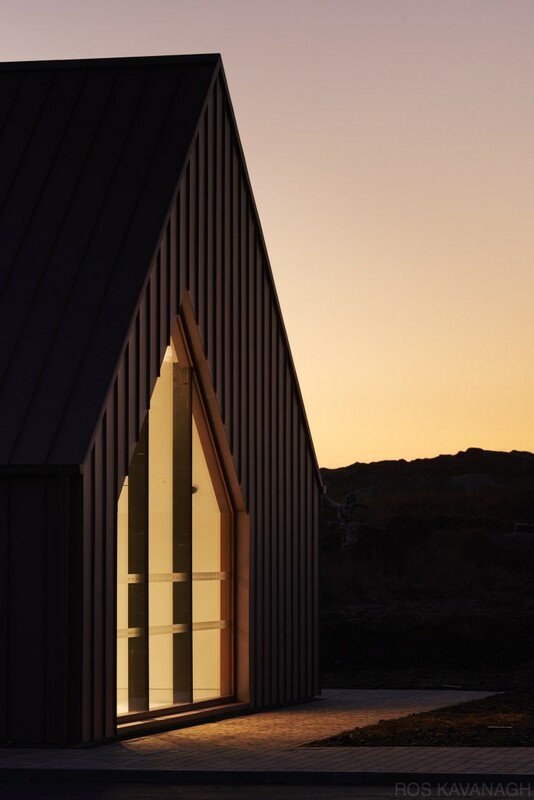 Bespoke joinery windows are proportioned with traditional vertical emphasis, with boarded opening vents referencing the rural half-door. 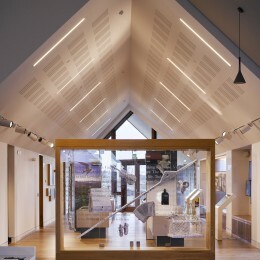 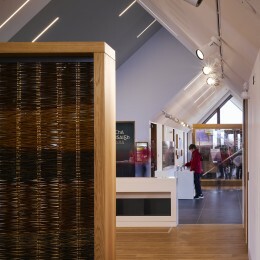 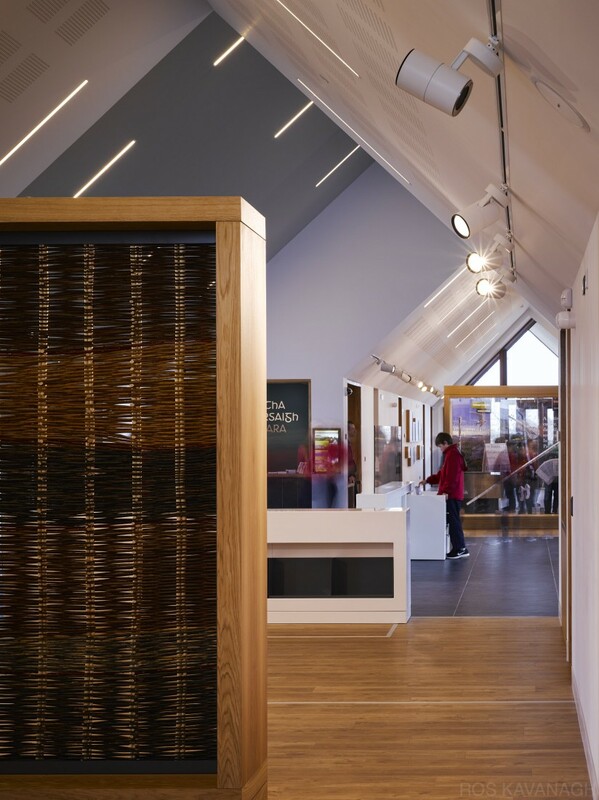 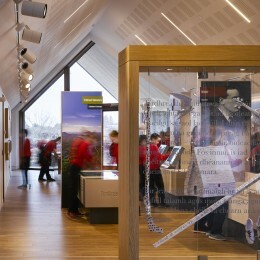 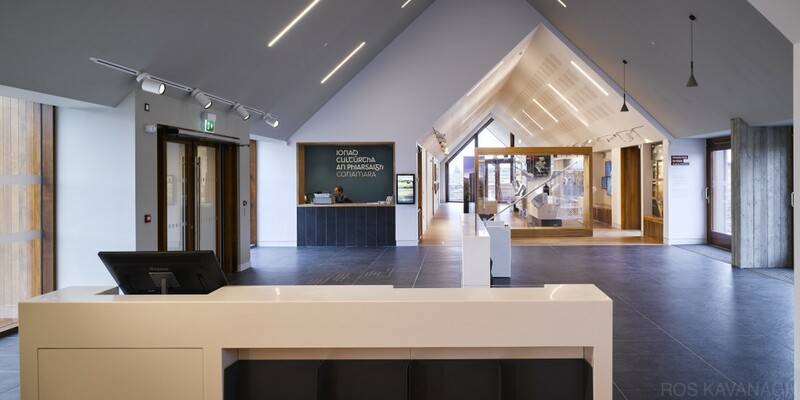 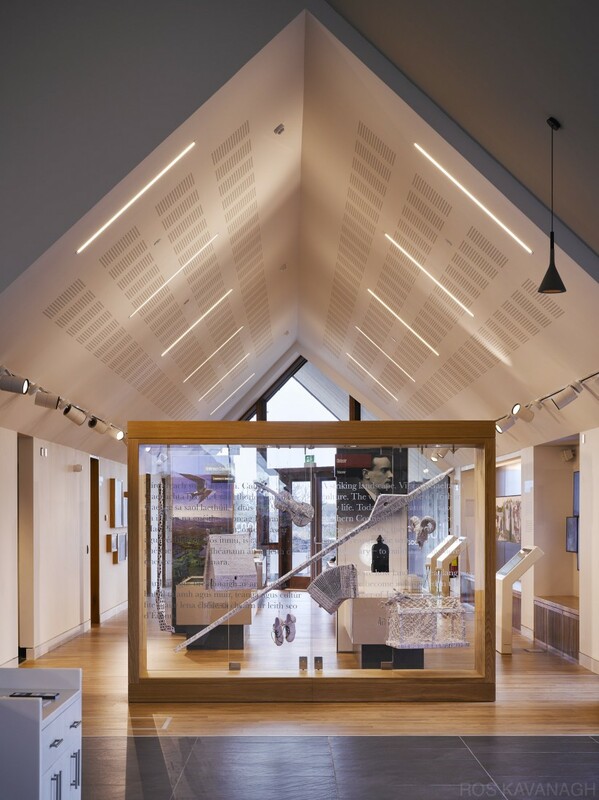 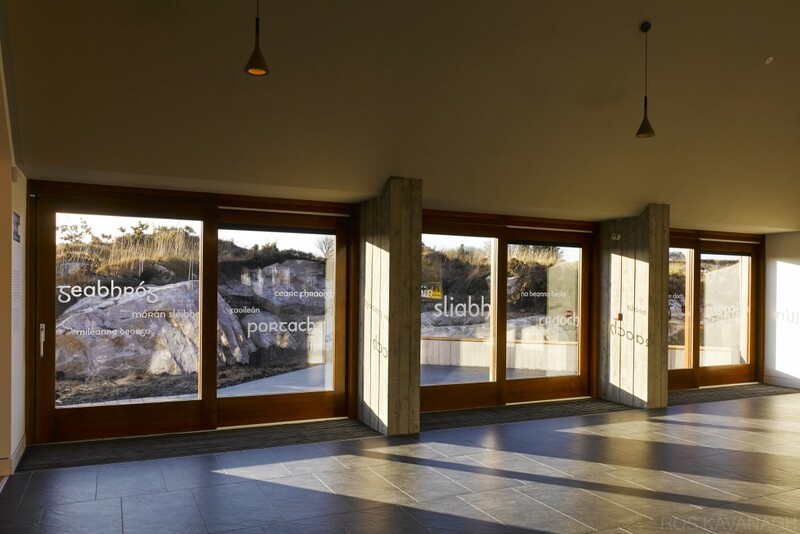 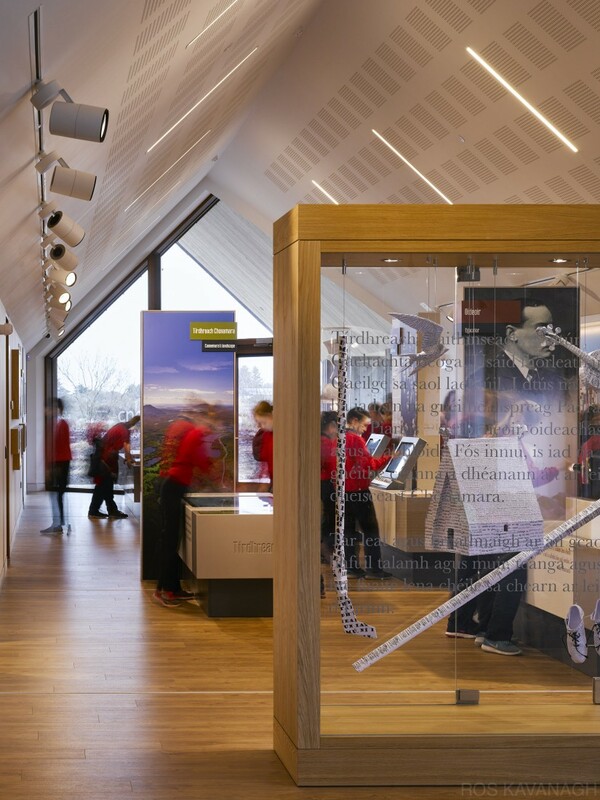 Traditional cottage finishes are chosen, such as the slate floor and timber-lined galleries.